NOTE: This content is old - Published: Monday, Oct 5th, 2015. Controversial plans to develop 365 homes on land in Wrexham were thrown out by councillors this evening following a heated debate at the Guildhall. Plans to develop 365 houses on vacant space on Home Farm Gresford Road, Llay had initially been put forward for approval by a Planning Officer. However the recommendation faced strong opposition from members of Wrexham’s Planning Committee, who said the development was too far out of settlement areas and could put pressure on local infrastructure and roads. The application has been subject to strong debate over the past few months, with a thread on Wrexham.com attracting well over 400 comments. Today’s meeting also saw a packed out public gallery, with Chairman of the Planning Committee Michael Morris noting it was the fullest it had been for some time. Speaking about the recommendation for approval, Planning Officer David Williams said: “This application is in outline form. In the report we have highlighted there is clearly a shortage of housing land in Wrexham. “This site has much to commend it in terms of planning policy – this location the site isn’t a green barrier, doesn’t lie within a special landscape area, it has low ecology value and not subjected to any infrastructural constraints. “One of the early issues was loss of agricultural land. However only 17% of the best and most versatile land will be lost as a result of this development. There is no objection from the Welsh Agricultural Division. “As far as surface water drainage is concerned Natural Resources Wales have not raised anything in terms of the application. We would not expect any surface run off to exceed what is on the site. However the application was challenged by members of the committee, who noted that the development is outside the settlement limit and could put increased pressure on the local schools and health clinic. Prior to this afternoon’s meeting both Lesley Griffiths AM and Wrexham MP Ian Lucas issued statements opposing the development. However the input from local Assembly Members was challenged by Chairman Michael Morris, who said it was the Welsh Assembly’s ‘dictatorial attitude’ which is making the council look at sites outside of the settlement area. Cllr Morris added: “I find it pretty rich for assembly members to sort of send in observations, quite frankly saying this is outside of settlement. It is their dictatorial attitude which is making this council have to look at sites outside settlement. Concerns regarding sewage, traffic issues and congestion on the straight mile / Crown junction and water drainage were also raised. 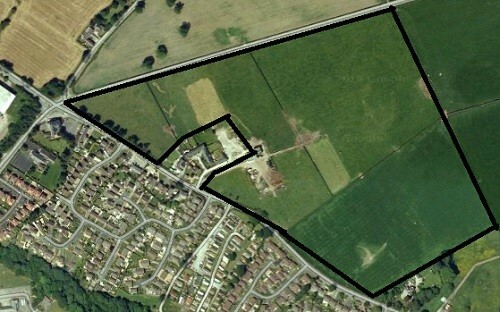 Speaking against the development, Cllr Mike Edwards said: “It clearly is outside settlement limit. In the past we have looked at why we should allow them on edge of settlement. I don’t think its well attached to the community of Llay, it’s too large an addition to the community – you’re talking about 1000 people. These concerns were echoed by Cllr David Griffiths, also commented on existing issues with sewage in the Llay area – along with the increase of pressure on the roads in Llay and the surrounding villages. A recommendation for refusal based on the development being outside the settlement limit and an illogical expansion to the village was put forward – with 15 councillors voting in favour of the recommendation against the development. Cllr Graham Rogers abstained from the vote. A lengthy debate on the development along with this evening’s decision to refuse approval for the development can be viewed on the Wrexham.com Forums here.